From about the 8th or 9th centuries onwards a new type of Buddhism began to develop which later became known as the Tantrayana, the last of the three great 'vehicles' of Indian Buddhism. 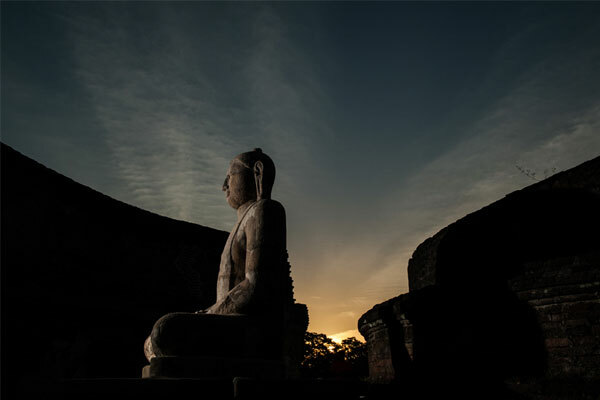 In the beginning this new interpretation met with disapproval amongst the more traditional monks and nuns, so King Dharmapala (775-812) founded a monastery named Vikramasila especially for its study. One Tibetan source gives us this description of the monastery. "Sri Vikramasila was built on the bank of the Ganges in the north of Magadha on the top of a hill. Around this were fifty three small temples for the study of the Guhyasamaja Tantra and another fifty four ordinary ones, all being surrounded by a wall. Thus the number of temples was one hundred and eight. He (Dharmapala) also provided requisites for one hundred and eight pundits." From other sources we also know that there was a huge courtyard big enough to hold 8,000 monks, that at the entrance to the main temple were two statues, one of Najarjuna and another of Atisa, and that the monastery’s perimeter wall had six gates. At the main entrance there was a dharmasala to accommodate those who arrived after the gates had been locked at night. What the monastic universities at Valabhi and Bodh Gaya were to early Buddhism and Nalanda was to Mahayana, Vikramasila was to Tantra. Some of the monasteries ‘gate keeper scholars’ were amongst the greatest names of this twilight period of Indian Buddhism. They included Santipa, Jetari, Ratnavajira, Jnanasrimitra and the great Naropa. Vikramasila’s first abbot, Buddhajnanapada, was the author of some 14 works and was described as ‘a great pundit learned in many fields of knowledge.’ The monastery’s greatest son however was the Bengali monk Atisa (982-1054). Apart from being a brilliant scholar and prolific writer, he also developed a new curriculum for the university, built more rooms for its monks and invited some of the best pundits of the time to come and teach there. The colophons on several of Atisa’s works state that he wrote then "while residing at Sri Vikramasila Mahavihara." At its height during the reign of King Ramapala at the beginning of the 11th century there were 160 teachers and 1,000 students. They are known to have come from all over north India as well as from Kashmir, Java, Nepal, Tibet and even Sri Lanka. Vikramasila’s connection with Tibet is of course well known, its connection with Sri Lanka less so. However, Tantra flourished in Sri Lanka for about 300 years and teachers from Vikramasila were sometimes invited to the island. A Tantric work called the Caturasitisiddhapravritti, says that Santipa, one of the greatest of the legendary 84 siddhas and a teacher at Vikramasila, visited Sri Lanka at the invitation of the country’s king and stayed for three years. Nor was the movement one way, Lankajayabadhra, famous for his expositions of the Guhayasamaja Tantra was one of the great Sri Lankan Tantric scholars who taught at the monastery. Some Tantric practitioners had a bad reputation for unconventional behaviour, but such things were not tolerated at Vikramasila. It is recorded that a monk named Maitrigupta was expelled for bringing alcohol into the monastery. As was the custom, he was ejected over the wall rather than being allowed to leave through the main gate. Towards the end of the 19th century European and Indian scholars began speculating about where Vikramasila might be. Silao, just south of Nalanda, Sultanganj near Bhagalpur and Hisla south of Patna were all suggested as possibilities. In 1901 archaeologist Nundalal Dey suggested that it might be at Patharaghat where there were several huge mounds and fragments of Buddhist statuary near a hill overlooking the Ganges. One ancient Tibetan source says that the monastery was situated "where the holy river flows northward" and indeed the Ganges does turn north at Patharaghat. Although Dey’s suggestion is now widely accepted as correct, excavations at Patharaghat have so far failed to find a single inscription or seal actually mentioning the name Vikramasila. Today Patharaghat is one of the most interesting Buddhist sites in north India and yet at the same time one of the least known and least visited. At first it seems to be somewhat out of the ancient heartland of Buddhism but in actual fact this is not so. Nearby is Champanagar, the Campa of old, visited by the Buddha and the scene of several of his discourses. To the west is Munger, a town that is believed to derive its name from Moggallana, one of the Buddha’s two chief disciples. The Chinese pilgrim Xuanzang spent a year in this town studying with Tathagatagupta and Kshantisimha. At Sultanganj there are the ruins of another huge Buddhist monastery. A magnificent bronze Buddha statue recovered from these ruins is now one of the great treasures of the Birmingham Museum. The fact that a few local village temples have ancient Buddhist statues in them now serving as Hindu gods, also attests to the fact that Buddhism once flourished in this region. But that was long ago. Today Bhagalpur district where Patharagahat is situated is perhaps the most poverty stricken and lawless areas in India. Nonetheless, a few years ago I made the long and gruelling trip to the place. We hired a four wheel drive in Bodh Gaya and set off. After hours bumping over dusty pot-holed roads we got to the Ganges and began to follow it towards the east. We arrived in Bhagalpur around sunset, booked into the town’s only hotel, a truly seedy and rundown establishment, and fell into bed exhausted after the long drive. Leaving Bhagalpur early the next morning we arrived at Patharaghat in about two hours. Patharaghat itself is a hill with its rocky north side washed by the Ganges and its top offering a commanding view over the river. The first thing we noticed were a series of caverns dug out of the side of a rocky water-filled depression. Local lore says that these mysterious cavern were the result of mining in ancient times but their real origin and purpose are unknown. At the foot of the nearby banyan tree is a beautiful statue of the Mahayana bodhisattva Tara, some votive stupas and other pieces of sculpture. The Tara is now being worshipped by locals as a Hindu goddess. A little further on along on the side of the hill is the Bodhesvaranath Temple. Just inside the main gate are a collection of ancient statues of the Buddha, Tara, Avalokitesvara and other bodhisattvas. The first shrine has another statue of Tara at its entrance. Right next to this is a cave with two chambers cut out of the side of the hill and outside the temple’s back gate is a similar one. About a hundred yards beyond the temple is yet another cave, large, finely cut and with a panelled ceiling. Another modern Hindu temple is situated right beside the water and all the rocks nearby have ancient carvings on them. All the sculpture that once lay neglected around the ruins are now displayed in the new museum at Vikramasila, even some statues that were removed to other museums in the early 20th century have been given to the new museum.